Wow what an interesting plant. 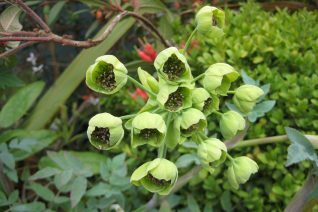 This perennial member of the carrot family from Mexico almost immediately recalls a Hellebore. Nope. Clumps of blue divided leaves are very pretty and surprisingly evergreen even through the coldest temperatures. In spring the stem elongates to carry acid green cupped shaped flowers on a circular arranged inflorescence. Part shade to shade in rich, well drained soil. There is only the male form on the market in the U.S. as far as we can tell so no seed set. Tends to flop or lean on other plants…just what it does. To 30″ tall and as wide. Rich, well drained soil with light summer water. Looks absolutely nothing like a carrot.